The 2019 Major League Baseball season starts this week and that means that San Diegans will be flocking to downtown in droves to attend San Diego Padres games at Petco Park, especially in light of the signing of a new powerhouse player, Manny Machado! 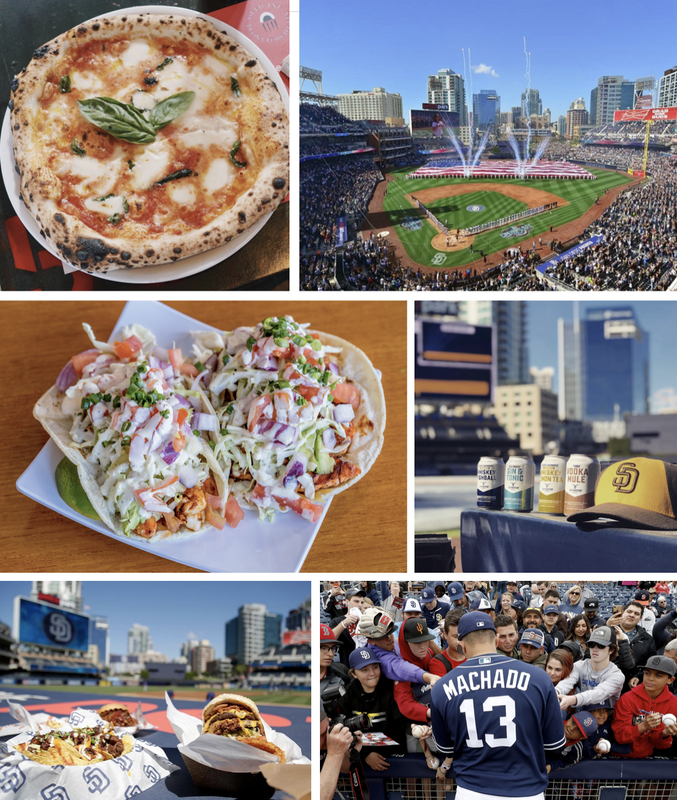 Here we run down our favorite spots to grab a bite or a drink inside and around San Diego Padres Petco Park during the 2019 MLB season - which is the 50th anniversary for the team! The addition of Manny Machado isn't the only thing new with the San Diego Padres thiw year. Petco Park has also added a new concert stage by Sycuan Casino, a renovated club area, and a new beer from Ballast Point that has beenn released as part of the organization's 50th anniversary celebration. 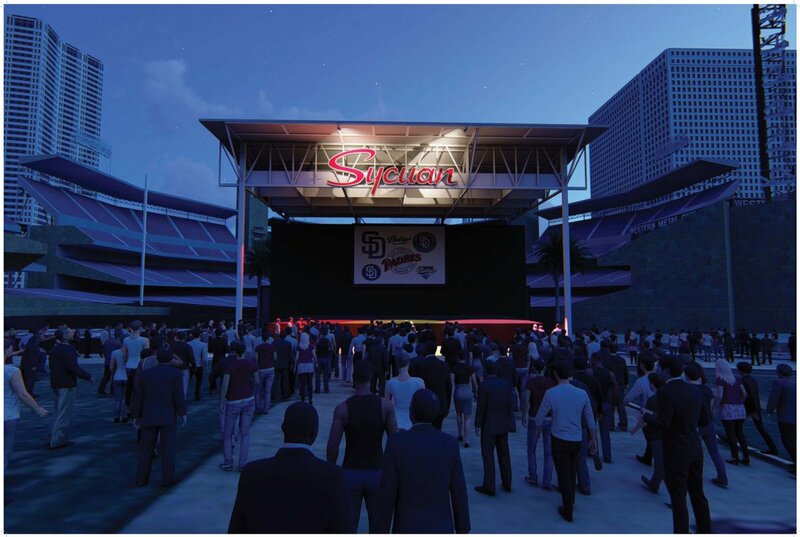 The newly constructed Sycuan Stage, located at Petco Park’s Park at the Park will host approximately eight national touring acts annually, offering a general admission capacity of over 6,000. Petco Park has also unveiled a new premium space for this season, renovatinng the Compass Premier Club to expand the bar area with retractable windows, technology upgrades, and an overhauled décor. Lastly, to commemorate the 50th anniversary of the Padres, the company has teamed up with Ballast Point Brewing Company to introduce the Swingin’ Friar Ale - a 100% Simcoe hopped pale ale that will be available at Petco Park this season and other locations in the San Diego area. And as alway at Petco Park, ballpark food is no longer just hot-dogs and peanuts. Nowadays, it can be healthy, delicious and even upscale, especially in America's Finest City. San Diego Padres' Petco Park is filled with offerings from some of our city's best food and beverage purveyors - including Buona Forchetta, Hodad's, Carnitas Snack Shack, Phil's BBQ, Baked Bear and more - so a visitor can get a taste of the area's most popular eateries and sample some of our city's finest craft beer and spirits just by exploring the concessions at the ballpark. Below we have outlined what there is and where you can get it inside and around Petco Park. Our top picks are marked with an asterisk (*). 10 Barrel Brewing Bar - 111, 324, 325 - InBev owned beer from Portland and available at a tasting room and restaurant in San Diego's East Village. .394 by AleSmith* - Toyota Terrace Section 217 - Full-service bar and restaurant by Alesmith Brewing honoring Tony Gwynn's legacy with a variety of food options including salads, mac & cheese, fried chicken and more. AleSmith Brewing - 107, 211, 229, 305, 328 - Craft beer from a San Diego brewery. Baked Bear* - 124 - Local ice cream shop that specializes in custom made ice cream sandwiches. Blue Water Seafood Market & Grill - 117, 220 - Fish sandwiches and tacos, as well as poke and sashimi. Board & Brew* - 107, 205 - Custom sandwiches and craft beer. Brigantine Seafood & Oyster Bar - 202, 204 - Fish and chips, clam chowder, fish tacos and other seafood. Budweiser Grill - 110, 113, 131 - Sandwiches, burgers, snacks and crappy beer. Budweiser Beer Loft - Western Metal - Nuts and mediocre beer. Budweiser Patio - 227 - Food and basic beer. Buona Forchetta* - 104 - Neapolitan & Roman pizza and gelato. Cardiff’s Seaside Market* - 107 - A market inside the ballpark! A great spot for salad, juice, flatbreads, a burgundy pepper tri-tip sandwich, snacks, and hot and fresh comfort foods. Cardiff's Seaside Tri-Tip* - 110, 129, 303 - Famous BBQ tri-tip sandwiches from Cardiff Market, as well as tri-tip nachos. Carnitas Snack Shack* - 128, 228 - A San Diego institution for porky deliciousness, get the famed Triple Threat pork sandwich. Carnitas Snack Shack Bar* - 126, 226 - Get a drink to go with your pork belly! Craft Beers of San Diego* - 107, 211, 229, 303, 328 - San Diego is America's finest beer city and this spot rounds them all up. Cutwater Spirits Rum Bar - 103 - A bar dedicated to all things rum by a local distillery. Donovan's Wines at the Park* - 104 - Over 35 selections of wine from a San Diego steakhouse and seafood destination. The Draft by Ballast Point - 207 - Remember when Ballast Point was a San Diego brewery? Elysian Beer - Park at the Park, 326 - Budweiser bought this once-craft brewery a while back and is now slinging their beers, which are actually pretty good. Estrella Cantina - Park at the Park, 112, 117, 135, 202, 312 - Mexican eats and beer. Gaglione Brothers* - 124, 319 - San Diego cheesesteaks, garlic fries and a pepper bar. Gaglione Brother's Fry Stand - Park at the Park, 101 - Cheesesteak fries anyone? Goose Island - 306 - Once upon a time, this was a craft brewery from Chicago, but now it's part of Big "Craft" Beer. Hodad's* - 104, 131, 300, 316, 325 - The Famous Ocean Beach burger destination is available in the park. Get the bacon cheeseburger, fries, onion rings and pretty much anything else. Iron Fist Brewing - 107, 211, 229, 305, 328 - Vista craft brewery. Jack & Craft - 117, 226 - Snacks, caramel corn, and craft beer. Karl Strauss* - 102 - Grab brews from San Diego's original craft brewer. Karl Strauss Red Trolley - 112, 129 - More beer from the K-Man! Lane Field Lemonade - 102, 119, 133, 206, 215 - Cotton candy, snow cones, Dippin' Dots, churros and, of course, lemonade. Lexus Home Plate Bar, Lounge and Restaurant - behind home plate - Requires a one-time non-refundable yet transferable membership fee per seat. Serves as a full service bar and upscale lounge in one of the most sought after sections of the park. The Loft by Budweiser - Western Metal Building - We wouldn't set foot in here so who knows? Lucha Libre* - 119, 120, 227 - San Diego's king of monster burritos is dishing out Mexican fare in Petco. Miguel's Cocina* - 104, 204 - This Mexican concept from the Brigantine Group offers staples like the surf and turf burrito, fish taco, carne asada tacos and more. Ask for extra white sauce. Mister Softee - Park at the Park, 104, 117, 128 - Cool off with some soft serve ice cream or a root beer float! Omni Hotel Premier Club* - 108 - This is an enclosed lounge where fans can eat their hearts out at a buffet. Pacifico Bar - 119, 122 - Get some Mexican beer! Phil's BBQ* - Park at the Park, 113, Western Metal Building - Go for the El Toro or Broham sandwich and maybe some baby back ribs. Pizza Port* - 121, 213, 311, 320 - Specialty pizza and craft beer from a local San Diego brewpub. The Porch by Pacifico - 124 - Mexican beer spot. The Rail - Western Metal Building - Great view. Randy Jones Grill* - Park at the Park, 101, 118, 119, 124, 204, 303, 306, 321 - Named after the Padres' pitching sensation, this barbecue hub is where you want to go for half pound bbq hot dog, pulled pork, brisket, etc. Sculpin IPA Bar - 101, 226 - A bar from Ballast Point devoted to their $1 Billion IPA. Seaside Market Tri Tip Nacho - 204, 308, 322, 327, 309 - "Cardiff crack" is what they call this tri-tip, and you'll realize why when you have it in nacho form. Stella Artois - 107 - Beer from Belgium. The Still by Cutwater Spirits* - Toyota Terrace Section 222 - A fun bar with an amazing view of the ballpark, good cocktails, and food from Blue Water. I once spent an entire game in this spot. Tarantino - Park at the Park - Get your Friar Franks and sausage from a local company. Vegetarian - 107, 303, 315, 320 - Food for the perpetually Meatless Monday people. Wonderland Ocean Pub* - 307 - Offer a full bar and beer from Resident Brewing, this OB-hotspot is now bringing San Diego food and drink to Petco. Yogurtland - 104, 105 - Frozen yogurt and all the fixins'. Zenbu Sushi* - 220 - An assortment of sushi rolls from a local company. Upper East Bar - Poolside rooftop bar atop nearby Hotel Solamar with tasty food and delicious drinks. Knotty Barrel and Brewing - Tasty grub and local beer. The Blind Burro - Upscale Mexican food. The Deck at Moonshine Flats - Legit BBQ paired with lawn games and a full bar at this country-themed spot. Stone Brewing Tap Room - Stone beer right next to the park with pizzas and more. Half Door Brewing Co. - Brewpub in a really cool repurposed Victorian home setting. Bub's at the Ballpark - Wild bar and eatery with tasty sandwiches and wings. Social Tap - Nice bar/restaurant with a porch damn near in Petco's Park at the Park. Oscar's Mexican Seafood - Great seafood tacos. Altitude Sky Lounge - Rooftop lounge atop the Marriott looking down into Petco. Water Grill - Upscale seafood spot with raw bar. Pendry San Diego - This hip luxury hotel has numerous spots to grab a bite, including Lionfish, Provisional, Nason's Beer Hall, and its rooftop Pool House. The Padres offer frequent promotions and theme games, weekly Taco Tuesday specials (reduced price tickets and $2.50 tacos), as well as frequent special events like College Night (tickets starting at $15), Party in the Park, Beerfest, Cocktailfest, WineFest, Taste of Petco Park, KidsFest, Postgame Fireworks, Postgame Laser Show, and more. Petco Park is located at 100 Park Boulevard in downtown San Diego. 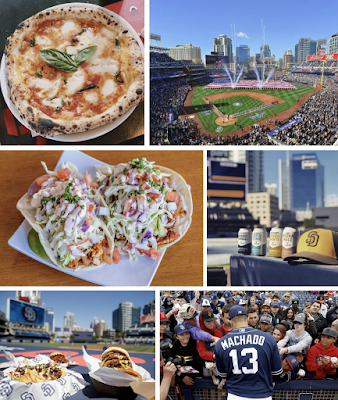 For a comprehensive listing of Petco Park food and beverage offerings and to get tickets to games, visit padres.com.